EquityMultiple’s cash-flowing investments returned a weighted average of 8.76% to investors in the calendar year 2018. The 8.76% aggregate return for EquityMultiple’s cash-flowing investments compares favorably to indexes in a year that saw public markets roiled by volatility, particularly in Q4. 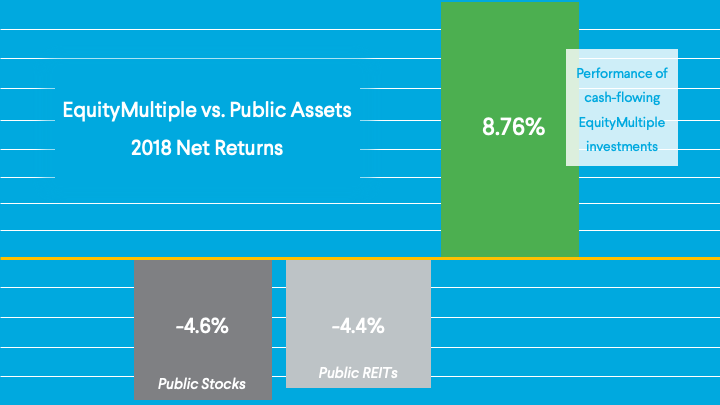 For example, the S&P 500 ended 2018 down 4.4% for the year , while public REITs ended the year down 4.6%. With public equity markets exhibiting greater volatility, we believe that now is a better time than ever to diversify into private-market commercial real estate. Our Real Estate Team practices a rigorous underwriting process on all potential investments resulting in strong performance across our portfolio. For a more comprehensive view of portfolio performance to date, please review our Track Record utility, which will be regularly updated as longer-dated investments come to term in order to provide transparent and up-to-date view of our portfolio’s performance. We believe we can reduce the potential negative impact of real estate market cycle risk, by emphasizing shorter term investments. By participating in deals with a defined exit strategy OR a near term maturity (typically between six and 24 months), sponsors are incentivized – if not required – to execute their business plan in a timeframe that may mitigate the severity of macro market events. Related to the above, we believe that at this point in the cycle our investors are best served by investments that carry payment priority. In many instances, this means participating in the debt portion of the capital structure: senior and subordinate debt or preferred equity investments. While this may limit upside potential, a strategy of pursuing investments that carry payment priority will enhance our investors’ legal rights and likelihood of recovery. Non-Recourse or “Bad Boy” Carve-outs: Typically, EquityMultiple’s investments are non-recourse, which means that the recovery of our investors’ capital is only secured by real estate collateral. However, to further enhance our collateral package we require “bad boy” carve-outs. If any of these “bad boy” carve-outs occur, the investment could become a recourse obligation to an individual or company with financial wherewithal. Some examples of “bad boy” behavior include misrepresentation of financial statements, fraud, environmental contamination at the property or incurring additional debt collateralized by the property without our express approval. Lockboxes: In most instances, borrowers or operators have access to cash flow from their investment property and is responsible for paying property-level expenses, taxes, insurance and debt payments. Often, EquityMultiple is able to structure cash flow “trigger events” whereby the borrower or operator no longer has access to cash flow. After a “trigger event” cash flow would be controlled by a lender or EquityMultiple, who would pay the above expenses and retain any excess distribution as additional collateral. Change of Control Rights: We often structure provisions in our preferred equity operating agreements (most simply referred to as a joint-venture agreement) providing us the right to remove an owner or operator for certain acts or non-performance. These change-of-control rights would allow EquityMultiple to make certain decisions and control the operations and management at a property. EquityMultiple not only makes commercial real estate investing more accessible, but our model also facilitates diversification of your real estate portfolio. We facilitate this through low per-investment minimums and a streamlined investment process, allowing you to more efficiently diversify your real estate portfolio across markets, deal structure, and property type. We invite you to reach out to our Investor Relations Team to discuss your current portfolio and opportunities for greater diversification. We do not know precisely when the next recession will hit, or what the particular contours of that recession will be (which markets and sectors will be impacted, and which will be relatively unscathed or even benefit). We do know that investors can reduce their exposure to idiosyncratic risk by spreading the real estate allocation of their portfolio across markets and product types. The new Opportunity Fund paradigm for commercial real estate investments offers tremendous potential tax incentives. For a comprehensive review of tax incentives afforded under the new law, please visit our Opportunity Zones resource page. Neighborhoods and submarkets designated as Opportunity Zones might benefit from material investment capital and resulting improvement to the market over a sustained time period. The material tax benefits may be substantial enough to offset the potential downside or risk of actual loss. As a wise man once advised: “The time of maximum pessimism is the best time to buy, and the time of maximum optimism is the best time to sell.”. While EquityMultiple always takes a defensive approach when sourcing investments, we also pursue attractive, well-considered risk/return profiles if supported by the investment’s basis, market, and sponsorship. With our nationwide network of institutional owners, operators and lenders, we will continue to provide accredited investors with the opportunity to invest in high-quality real estate while achieving greater diversification. Notably, this excludes investments that are pre-cash flowing and have not begun delivering distributions to investors. This is the case in some common equity investments, where the business plan requires an initial period of value-add or ground up construction before the property stabilizes and begins delivering cash flow to EquityMultiple investors. Projects that are in this phase are not included in this calculation.